On 21 June 2017, United Nations Secretary-General António Guterres announced the appointment of Ana Maria Menéndez of Spain as the next Senior Adviser on Policy. Ms. Menéndez succeeds Kyung-wha Kang of the Republic of Korea to whom the Secretary-General is grateful for her commitment and dedicated service to the Organization. Ms. Menéndez brings to the position more than 30 years of experience in diplomatic service involving bilateral, regional and global issues. She has participated in negotiations on the major United Nations development conferences and has been involved in the United Nations disarmament agenda, the Security Council agenda, and in various reform processes within the United Nations system. Additionally, she has worked in the humanitarian and human rights fields. 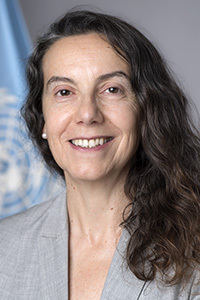 She previously served as Permanent Representative of Spain to the United Nations Office and Other International Organizations in Geneva, prior to which she was Minister Counsellor and Deputy Head of Mission at Spain’s Embassy in Tunisia (2009-2012). - and Counsellor at the same Permanent Mission (1998-2002). She holds a law degree from Complutense University, Madrid, and has one son.